While Automatic Identification Systems (AIS) go a long way towards increasing vessel safety and helping to prevent vessel collisions, many boaters also like to use radar for detecting vessels and other floating objects such as aids to navigation that do not have an AIS transponder. 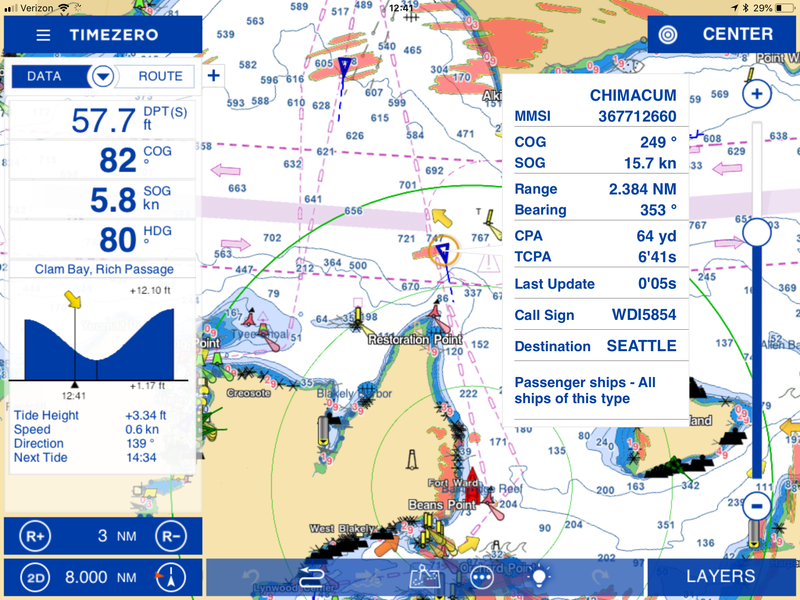 This article discusses a new solution from TIMEZERO aka Nobeltec that allows you combine charting, AIS and radar on an Apple iPad. The Vesper XB-8000 Class B AIS Transponder with Wi-Fi capabilities is one of our most popular AIS products. Many customers use the product with navigation apps running on Apple iPads but we also get a lot of questions from customers asking how to use the product with Rose Point Navigation Systems Coastal Explorer running on a Windows-based PC. This article provides guidance on connecting these two product together using wired or wireless methods. Want to connect the popular Vesper Marine XB-8000 Class B AIS transponder to a low-cost. low-power display? Do you also need a new VHF radio? Now you can solve both challenges with these two products tied together. Check out this article which covers how to hook up the Standard Horizon GX2000 VHF Radio with AIS display to the Vesper XB-8000. Last year I wrote an article describing how to get two of our most popular products to work together: Rose Point Navigation Coastal Explorer and the Standard Horizon GX2150 VHF radio with a built-in AIS receiver. Now Standard Horizon has released a new radio – the Standard Horizon Matrix GX2200 AIS/GPS Receiver VHF Radio. This new radio has everything the GX2150 has with the addition of a built-in GPS receiver. The question we are getting from customers is, how can I connect this new radio to a PC and can I get AIS and GPS data sent to the PC. Fortunately there is a simple solution using our USB Breakout Cable that allows Coastal Explorer or any PC-based navigation program to use the GPS, AIS and DSC NMEA data that is received by this radio. While the wiring is very straight forward, you need to configure a few settings on the radio to make this work. Does Your Red VHF Radio DISTRESS Button Work? Great article by Mark Bunzel published by the folks at Waggoner Cruising Guide. Two of our most popular products are Rose Point Navigation Coastal Explorer 2011 and the Standard Horizon GX2150 VHF radio with a built-in AIS receiver. And a common question we get is: can these two products work together? Fortunately the answer is yes.